To help you achieve optimum performance from your sporting dogs, Alpha combines Garmin GPS dog tracking technology with Tri-Tronics electronic dog training. This easy-to-use handheld system allows you to track and train your dogs from a range of up to 9 miles, delivering their exact position as often as every 2.5 seconds. 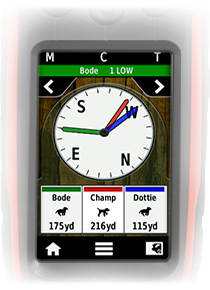 With the Alpha 100 handheld and the TT collar, you can pinpoint up to 20 dogs or hunters' exact positions on a large touchscreen display. 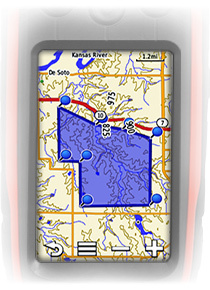 The Alpha handheld comes pre-loaded with 100K United States TOPO maps that will allow you to always know your surroundings. 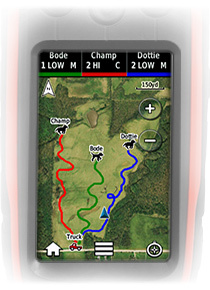 Using the Alpha 100, you can measure each dog’s speed, distance and the direction being traveled. Plus, you can receive notifications when a dog is “Treed” or “On Point.” A single Alpha 100 can track up to 20 dogs or fellow hunters when using either additional Alpha 100 handhelds or TT 15 devices (each sold separately, not compatible with Astro). 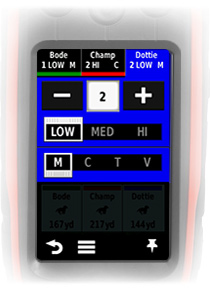 The Alpha 100 handheld helps you train and control your dogs to stop chasing unwanted game or to "recall" your position. The easy-to-access training buttons allow you to comunicate separately to each dog through safe and effective features, including 18 levels of momentary and 18 levels of continuous stimulation or an audible tone command. A lockout setting is available to avoid accidental stimulation or tone. There are two modes of level progression to allow you to customize your training even further. Traditional stimulation allows you to make quick changes within a predetermined stumulation level (low, medium or high). Linear stimulation allows progressively more stimulation through all 18 levels available. When using the TT 15, hunters can switch to Rescue Mode to prolong the battery life. When the TT 15 reaches a certain battery level, it will slow down the update rate at which it pings the Alpha 100 from every 2.5 seconds to every 2 minutes. 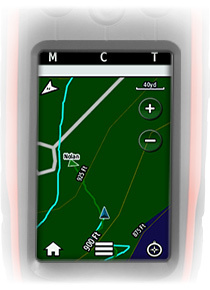 This mode should provide additional battery life to the TT 15, giving you more time to search for and locate your dog. Track and Train 20 Dogs - From the compass screen, get in-depth speed, direction traveling and distance away information for any dogs you've selected. And correct any dog on this screen without falsely correcting the others. At-A-Glance Dog Stats - Get the information you always need, like your dog's state (moving, treed, etc. 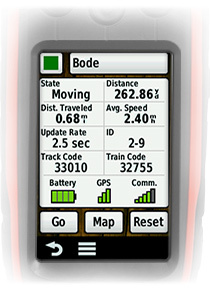 ), distance from the Alpha handheld, total distance traveled, speed, and update rate, all on one screen. Keep Them Away From Hazard - Don't wait until your dog is lost or in danger to get him back. Setup virtual boundaries on your map and receive an alert if your dog strays from your geofence so you can recall him right away. Your Own Bird's Eye View - Track and train up to 3 dogs based on where they are with BirdsEye satellite imagery. These highly-detailed raster maps provide a realistic bird's eye view of roads, parking areas, buildings, and terrain, including tree lines, lakes, rivers, and streams. Keep Your Dogs on Track - From the training screen, correct and recall multiple dogs with the help of Tri-Tronics electric training. Select traditional or linear progression plus tone or stimulation types. Keep Up With Your Buddies - Know where other hunters in your group are. Set your Alpha 100 handheld to show not only the dogs in your group, but also the other Alpha handheld users, too. Click the button below to add the Garmin Alpha 100 Combo w/TT15 to your wish list.